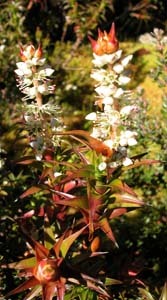 Richea gunnii is a common montane shrub that grows in boggy areas. It has distinctly softer leaves than R. scoparia. Also, unlike that species, the leaves often curve to one side and the inflorescences are quite loose.